Out of town this weekend but Skip is checking things out for opening/closing. Still some snow in various parts of grounds but he is hoping to open course Saturday with warm weather predicted. Please check with pro shop for Saturday tee times. Tim Crews from Crews Grinding Services from Springfield, MO came in today and ground the stumps from the trees we have removed so far this winter. We still have a few more trees in play areas to remove and a few along 3 fenceline that we will be saving to last. It took Tim a little over 3 hours to grind about 12 smaller stumps and 12 others that were pretty large(3' up to 8' in diameter). We will use some of the dirt material to throw back into the holes and will remove the parts that are mostly chips to reduce the amount of settling within the hole. Over the next few weeks we will cover them with topsoil and then sod so they will be healed in by the time the summer heat arrives. We removed a couple of the smaller ground stumps this afternoon. The crew will work full speed ahead tomorrow trying to get the remaining material picked up before the rain and snow comes in overnight Tuesday into Wednesday. Wet and packed soil is much harder to deal with than the loose material we have right now. Interesting note, Tim was going to a couple of other clubs after Glen Echo where he was going to be grinding over 100 stumps between the two clubs by the end of the day tomorrow. Did a little slow motion action on the grinder at the 8' diameter tree along #4. Kind of a cool look at the chips flying. First greens mowing of the 2016 season. Giddyup!!!!! The course will open for play on Thursday, February 18 for regular play. Carts on paths, sorry no red flags today. Due to frozen and soft green conditions, the course will remain closed. I expect we still might be closed on Thursday and can hopefully open on Friday. We will keep you posted. Quick video update from this morning. If you missed the post from February 3rd talking about winter greens, it is linked below. I've been doing some heavy duty turf research the last 11 days in the western time zone! 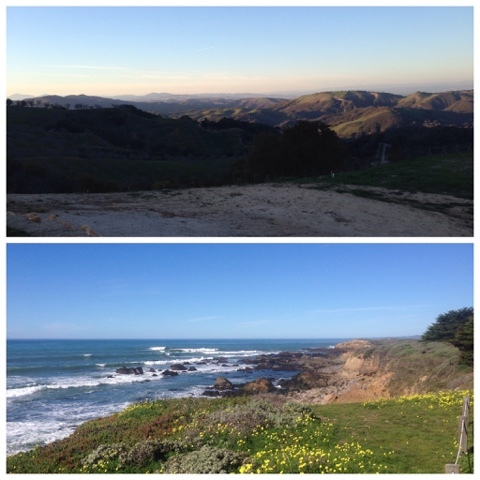 Well, four of the day's involved the yearly GCSAA Education Conference and Golf Industry Show. I expect we will be in the middle of a thawing cycle so caution will need to take place with opening decisions. I will be back in the office Wednesday as we start thawing to give some guidance on how we progress. 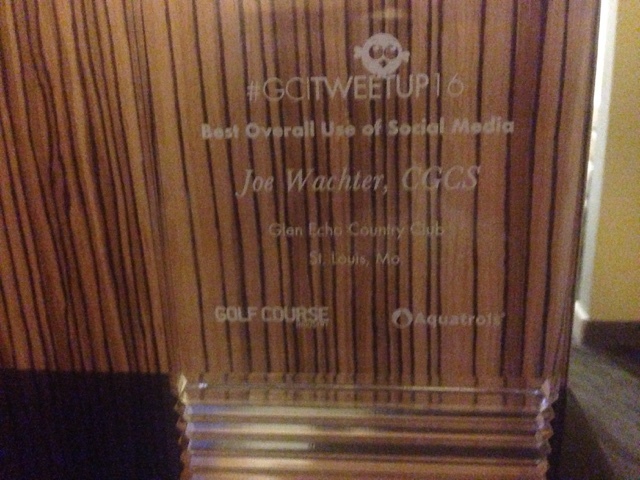 Honored to receive award for Best Overall Use of Social Media at Annual Conference and Show. Great work being done by many members of our association. Thanks to our membership for your support and the efforts of our staff who make me look good. The fellas dropped the two leader tree Pin Oak along #2 this afternoon. One leader if it fell or split apart would have gone directly perpendicular across the cart path/into the fairway and the other into the rough. When the men dropped the remaining 12' of the tree, it popped open like a watermelon. The cracked area was at least 6' long. This tree looked healthy on the top but both myself and one of our areas top arborists said it should come down. You brought me here to make the tough and correct decisions. I am relieved this evening that this tree is on the ground. Additional tree management work is taking place this week and over the next few weeks as we move through our list of approved removals. We will also be involved in pruning lower limbs on trees to raise canopies as time allows throughout the late winter and spring. Our work this week concentrated along #2 fairway and #3 tee. 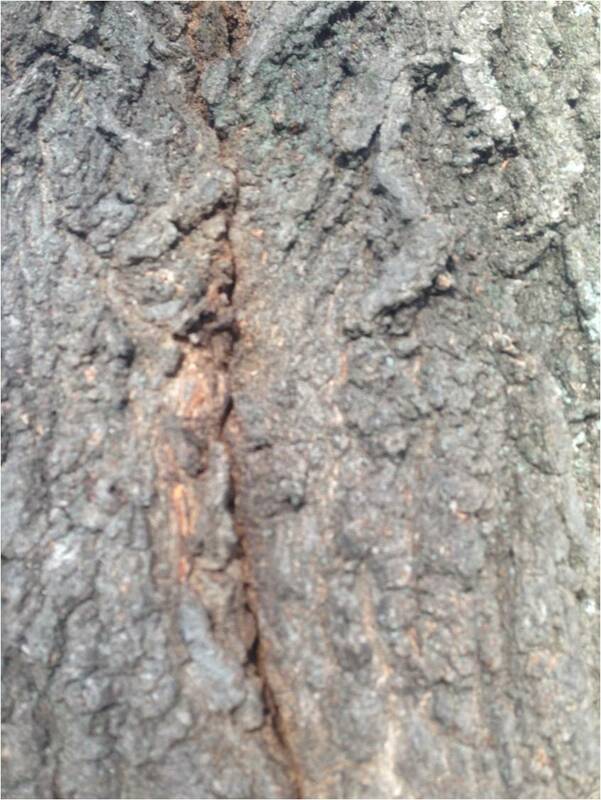 We have two severely compromised Silver Maples and a Pin Oak dual leader tree that has cracked and is being removed. 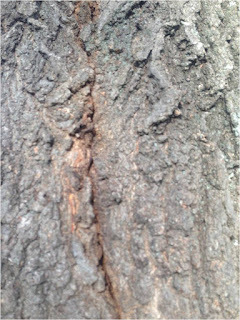 We will be spending $ 1,000 in April on cabling two other Oaks to slow their potential development of a large crack which will require their premature removal for safety purposes. 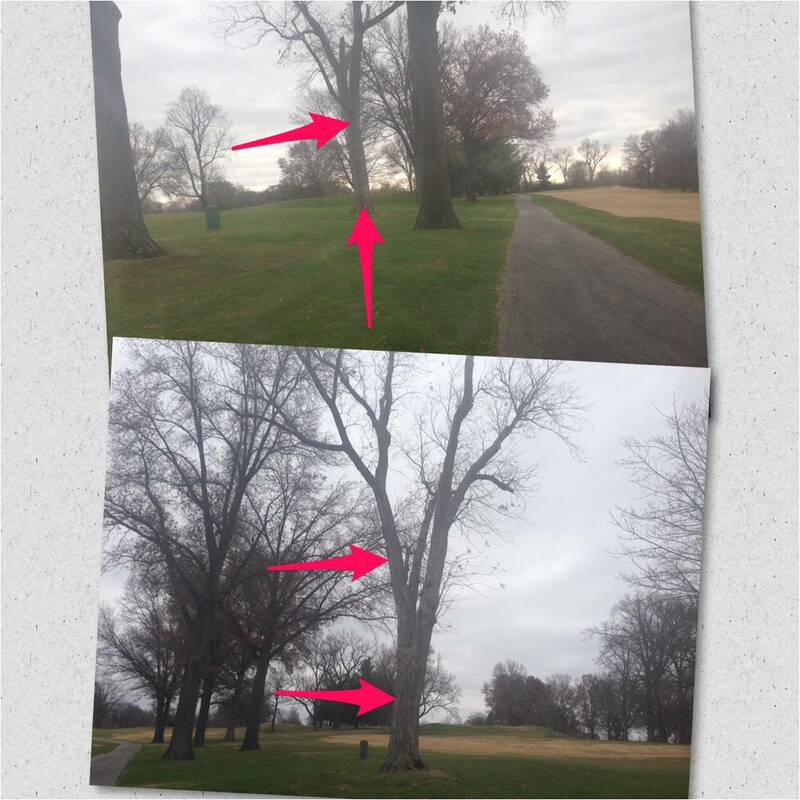 We will be placing a tree along #4 near the large Pin Oak that we finally removed once the stump is ground in the next few weeks. What I mean by finally is that I've had major pruning completed on this tree since I arrived 8 years ago in an effort to not remove it or an attempt to delay the inevitable. With my contractor/arborist out evaluating trees with me a few weeks ago, he said that tree was the worst he saw on property in a high traffic area and we should not wait any longer. I understand the concerns of folks who think trees are more important that about anything else but when it comes to hazard trees, we are left with no other option but removal. My efforts are to eliminate the potential for tragedy as well as completing the work in the proper time of year. The proper time of year saves us time and money for our operation. Large removals during the growing season increases the cost of removal by at least 25%-50% which includes increased contractor fees and lost time of my staff who should be managing turf. In the end, the biggest inconvenience is to our membership and guests. 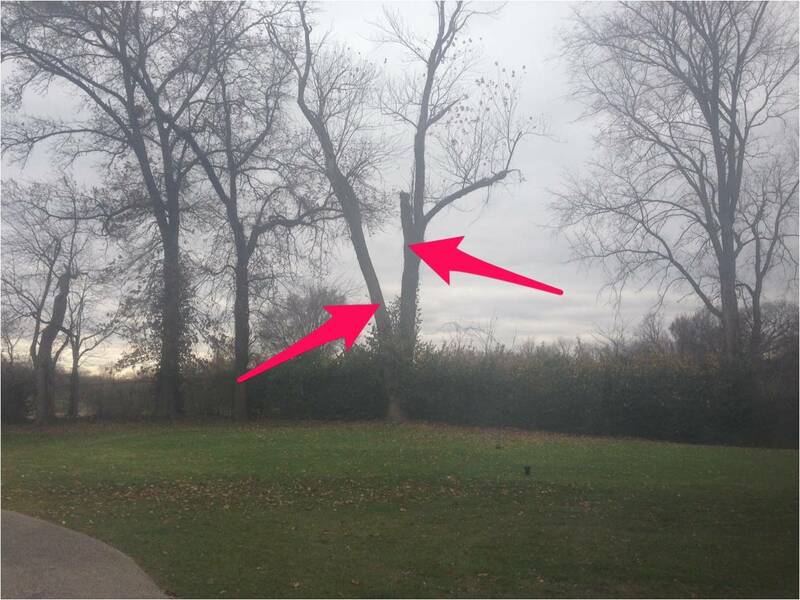 Additional removals are planned with a couple of Ash trees and three planned for removal on 18 in which two are hazardous Silver Maples and a Sweet Gum nearby. Once these 3 are removed, a new hardwood tree will be planted in their place. We will also be adding trees in our planned nursery behind 17 green as we move closer to spring. Stump grinding will be completed in the next few weeks once we get further along in our removals. Grinding stumps a few at a time would increase our costs by two to three times since we don't own our own grinder. I did just speak to our contractor and told him I wanted this work completed much earlier this year than in the past so we hopefully will have everything ground before the end of February. Same tree with limbs removed. Stub will be removed later today. Tree is 300 yards from green. Crack that was 3' long in the dual leader. Silver Maple about 50 yards past the Pin Oak. This was a very large upper limb that was nearly eaten through by carpenter ants. All the upper limbs were hollow. Staff working on cutting up the remnants that were dropped by our contractor. #3 tee Silver Maple. Back side limb hanging over fence died last season. Topping of tree by contractor. we will pull it over to prevent it from falling on the fence. 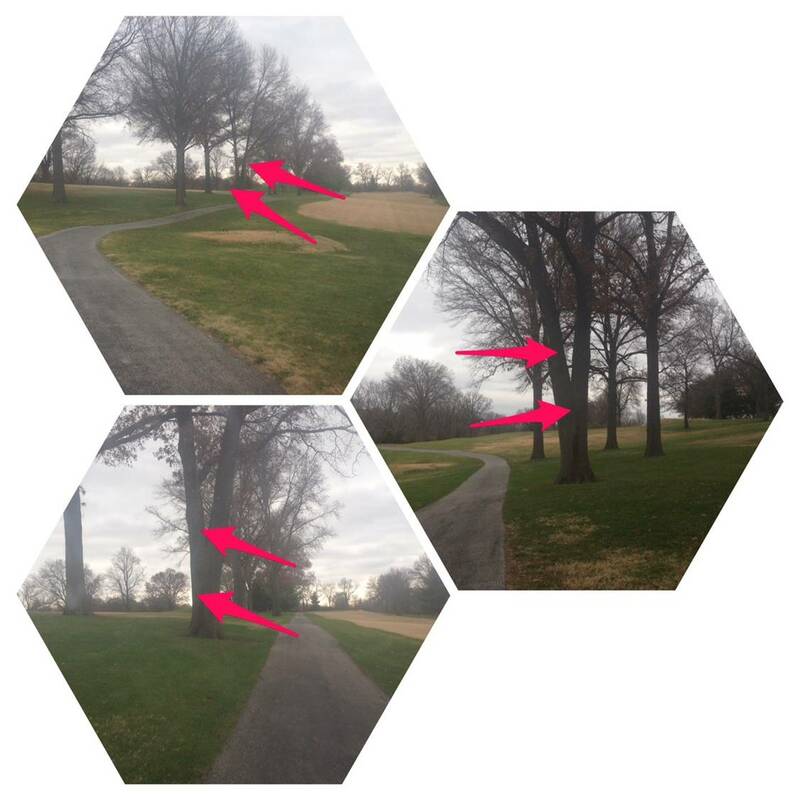 Additional trees along 3 tee that will be removed during the winter. This is an example. Removal will prevent personal injury as well as destroying fence if it fell onto it. A non-eventful month of weather in January. Warmer than normal but not extreme. Winter greens are just that, winter greens which in most cases means we do not do anything to them until the end of February or early March. Our temperatures in December were well above normal. We continued to mow and applied growth regulator that would stunt the poa annua and does slow the growth of the bent grass as well. We normally quit mowing the greens once the long range forecasts predict colder weather. It is important to allow the greens to come to rest. Growth slows and the plants begin to harden off which basically is the way the plant protects itself going into the coldest time of the year. Growth all but stops or slows greatly. Plant growth usually occurs not because of warm air temperatures but elevated soil temperatures which is what we had in December. The warmer air temperatures helped to slow the loss of heat in the soil. Just before Christmas we had quit mowing in anticipation of colder weather arriving. Winter did finally come in January but the warmer soil temperatures probably extended into the new year creating some additional growth of our turf. A beautiful last weekend brought a lot of people to the course but we were still in the process of greens completely thawing. The last thing I wanted or was going to do was put a riding machine on the greens or make an attempt to mow off the ends of the plant and possibly encourage them to wake up and grow. The plant that would wake the quickest would be the poa annua and to encourage it to begin growing is something I don't want to happen, sans the growth regulator applications which have a tendency to slow the plant way down coming out of winter. Another slight warming trend this weekend but more cold expected so I do not anticipate anything happening on our greens surfaces except changing holes and maybe possibly a roll which will help smooth the surfaces a little. 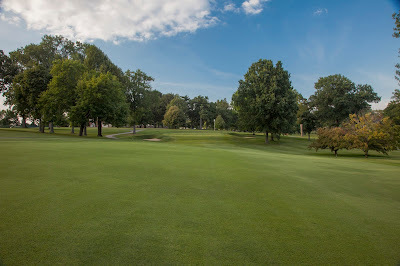 There are a number of clubs in town that are now playing on temporary greens in the approaches and do not let members play their regular greens. I understand the greens are a bit shaggy right now but its winter and any mowing could possibly have the turf break from dormancy prematurely. 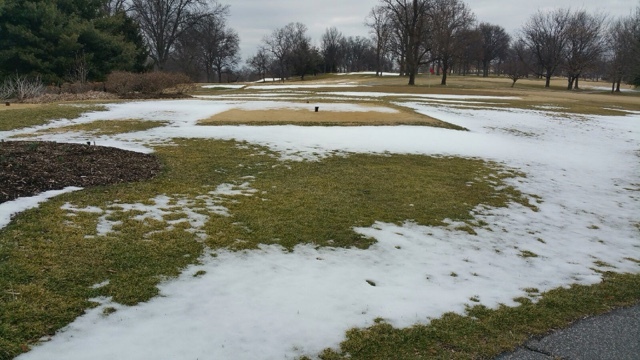 In 2013 it was shaping up to be an early spring until temperatures fell 8-10 degrees below normal which hammered our turf. 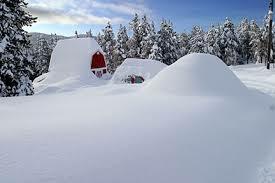 The long range forecast is not showing this type of trend but we will not take any chances. I hope everyone can remain patient, its not about ball roll out this time of year, its about enjoying a nice walk, swinging your clubs and spending time with your partners. I would recommend that if you want to work on your putting over the next few weeks, the rug in your office would probably be a more appropriate spot but I assure you by early April, our greens will give you all the challenge you might want for the next 6-7 months. The last few days with unseasonably warm temperatures and drier conditions, we began spraying our fairways with our pre-emergent product Ronstar which is the best product on the market for our 27 acres of fairways. This has to be done during dormancy or when the warm season turf is at rest so the herbicides have little to no negative effects on the turf. There are less expensive products than Ronstar on the market but these products disrupt root growth and or could further damage areas that have been weakened by shade, traffic and excessive moisture issues. Our fairways are the largest area of tightly mowed turf on the property and are a significant feature of our course. This is why we are using this products as well as making a concentrated effort in reducing the impact of bermuda contamination we have in the fairways. Our Bermuda Eradication Program as you know involves spraying other selective herbicides that negatively effect the bermuda throughout the growing season and replacing larger patches with new Zoysia sod. We also use a non-selective herbicide Prosecutor(Round Up Generic) in the mix in winter which will kill the poa annua which has germinated in the fairways since last fall. If we did not kill these spots of poa on the fairways, they could become pretty large before we begin mowing and disrupt your lie on the fairway and will also contribute many more seeds to the weed bank in the fairways that we continually fight. It will take about 2-3 weeks for the chemical during cooler temperatures to begin to show the effect of the Prosecutor. The pre-emergent is for crabgrass/goose grass weed control to prevent them from establishing in our fairways. The weeds actually germinate and then when the root of the weed comes in contact with the chemical it kills it. We will also be spraying our tees and range tees as well.